Your favorite music for always and eternity. A unique and always renewed impressive and natural adventure with the High End Mono Amplifier SOVEREIGN ETERNITY. Naturalness that gets under your skin. There is not much in life that makes you feel so full of respect and moves you emotionally as much as your favourite music. Presented in a realistic loudness ratio, precise spatial orientation and with incomparable sound balance with the SOVEREIGN ETERNITY Mono High End Amplifiers. Enjoy your music every day, like new for all eternity. 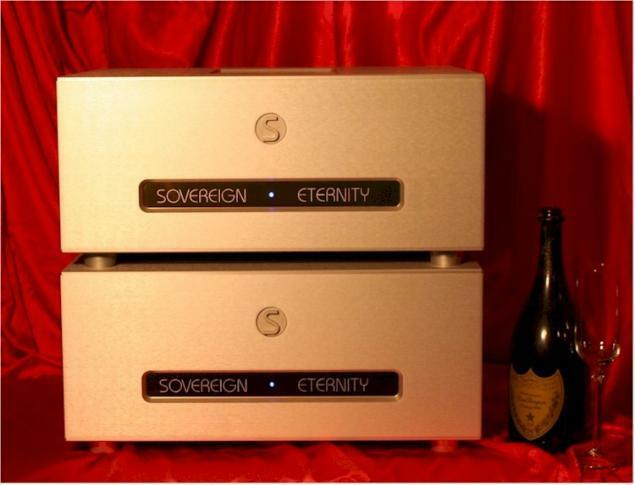 The SOVEREIGN ETERNITY High End Mono Amplifiers are what you could call "time machines". Experience live recordings of your favourite music from all time periods and all genres as if you were seeing these concerts live. Swing along with jazz music from New Orleans, the first concerts of The Rolling Stones or The Beatles, or live through emotional moments with Pink Floyd, Led Zeppelin or contemporary rock stars. Bring the stage of Rock’n’Roll home into your house or, if you’d, transform your home into an entire concert hall. Enjoy gigantic orchestral moments, be inspired by concert pianists such as Lang Lang and be impressed by grand opera. How about a special music evening today and a performance from the Metropolitan Opera in New York or a musical visit to the arena in Verona? Just do it. Whenever you want it. In the privacy of your own home. With the SOVEREIGN ETERNITY High End Mono Amplifiers. SOVEREIGN ETERNITY is the epitome of performance and organic nature, and thus guarantees an unforgettable musical adventure. The technology necessary for such an impressive result is housed in closed, thermally active casings common to all SOVEREIGN amplifiers. The SOVEREIGN amplifier casings are made from 10 mm strong aluminium all around. The closed casing design also distinguishes itself visually, far from the appearance of traditional amplifiers it provides optimal heat distribution at the internal modules and helps avoid those undesired micro-phonic effects. Heat dissipation uses the entire surface of the SOVEREIGN amplifiers which, in itself, explains the need for the precise and elaborate workmanship that goes into the manufacturing of the SOVEREIGN casing elements. The amplifying modules equipped with selected components are housed in the interior on the left and right casing walls respectively.The extremely generously dimensioned power supply unit sits on the bottom plate. Precision work and precision components for only one goal: your enjoyment of music. If you are one of those technology savvy music lovers then we’d love to send you more interesting technical details and data. Just let us know and we’ll send it. Our current SOVEREIGN price list is available for download as PDF file. For further information on our "High End Financing Service", you may also contact us at any time.